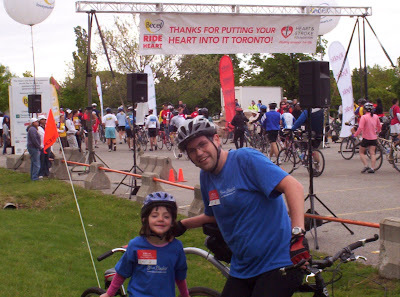 Marshmallow Man to Ironman: Ride For Heart - A Successful Day! We used a trail-behind bike for her, it's a bike trailer but has its own set of pedals. You'd think a 5 year old would coast for most of a 2 1/2 hour ride, but she kept pedaling and pedaling for almost the entire thing! I was very impressed. Our pace was quite good for the entire ride. I get a kick out of passing people in general (it's a guy thing), but passing people with your 5 year old daughter trailing behind you is very satisfying. Her and the bike probably add about 60 pounds, and an extra tire, so it was quite a work-out! Toughest 50K I've done in a long time. Meghan had a great time, I hope this encourages her to keep in shape for her entire life! We enjoyed some quality bonding time, and that's priceless. And we raised some money for the Heart & Stroke Foundation. And hopefully got some business for my wife's web site! I'll be back in 2009!